Congratulations you have successfully turned your grapes into wine. The hard work is over and now you can relax! NOT! Fermentation isn’t over yet. Now it is time to begin thinking about malolactic fermentation MLF (otherwise known as secondary fermentation). Malolactic fermentation is the process in winemaking where tart-tasting malic acid, naturally present in grapes is converted to softer-tasting lactic acid. Malic acid tastes mostly like green apples. By contrast, lactic acid is richer and buttery tasting. MLF enhances the body and flavor in wine, producing wines of greater palate softness and roundness. Most malolactic fermentations are done on red wine varietals and barrel fermented Chardonnays. In some red wines the choice is optional such as Zinfandel or Pinot Noir. White wine varietals like Sauvignon Blanc, Viognier, and Riesling, for example, do not undergo any malolactic fermentation. These wines are recognized for their high acid levels and crisp finish. That is not to say that you can’t experiment. In 2009 instead of inoculating her Syrah, Robyn accidentally inoculated her Sauvignon Blanc. (She says, "Don’t judge me, it was dark.") The wine ended up being quite delicious so she called it Fumé Blanc and entered it in the Harvest Fair, where she received a silver medal! On the contrary, the first year that she made Zinfandel she chose not to inoculate with malolactic bacteria (otherwise known as Oenococcus oeni). We all really like fruit forward jammy Zinfandel so she made the choice to pass on MLF. That wine also received a silver medal at the Harvest Fair. The point is that the winemaker gets to decide whether or not to undergo MLF. Equip yourself with the following information on the ins and outs of MLF, so you can decide what to do on your next wine. There are three primary reasons to put your wine through MLF: stability, acid reduction and flavor. The stability of wine is improved by taking the wine through a complete MLF, ending with 30 ppm of malic acid or less. Residual malic acid above this level still has the potential for unintended fermentation, just as residual sugar in a wine could possibly cause a fermentation to restart in the bottle. Both situations may produce cloudy, effervescent wine in the bottle. The fermentation of malic acid results in the production of lactic acid. As each molecule of malic acid is converted to lactic acid, the contribution to titrable acidity (TA) drops by half. 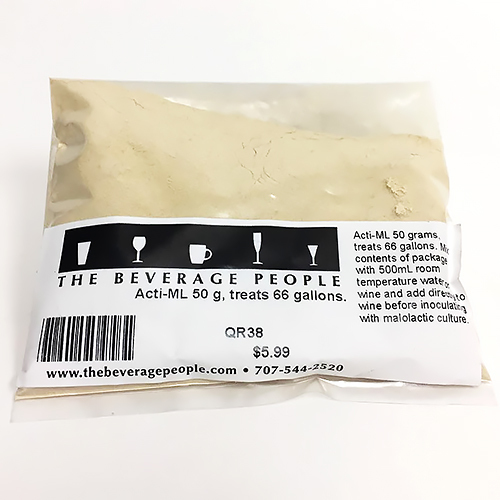 In a wine that starts with 0.2% TA from the malic acid (with the remainder of the TA made up of stable tartaric acid), MLF will drop the 0.2% malic portion to just a 0.1% lactic portion. That represents a 0.1% drop in the overall TA. That is a significant change in acidity---the flavor profile of the wine will be much different post-MLF. The combined effect of acidity reduction and change in acid type can turn a bright and sharp wine into a softer, more approachable wine. Our favorite time to perform MLF is at the end of primary fermentation. Most commonly we add the culture when 0 brix is reached. In reds, this means adding it just after pressing. If the culture is added early while sugar is present, there is a risk of producing volatile acidity. 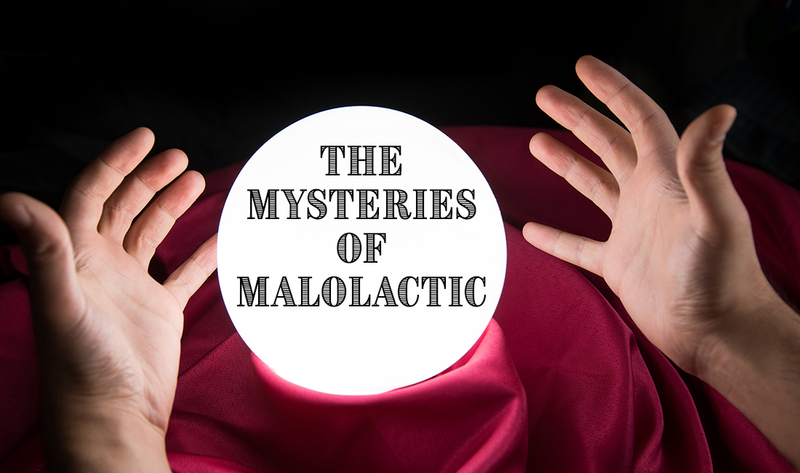 The malolactic bacteria can ferment sugar into VA, so it is best not to give them the chance. As long as you choose a strain that can handle high alcohol and is produced for direct addition, add it at the end of primary. Oenococcus oeni are not the only strain of bacteria that will ferment malic acid. There are wild strains of lactobacillus that sometimes infect our beverages. In brewing, it is a very common spoilage organism and can result in a complete sour-ing of the beer. In wine, it is also best to avoid them. They do not ferment as cleanly as oenococcus oeni and may contribute offflavors that cannot be removed. A “spontaneous” MLF will likely result these undesirables. Using a laboratory produced package of malolactic bacteria is the most predictable option. Flavor profile, alcohol tolerance, SO2 tolerance, and other factors are known and reliable. You don’t want to risk ending up with a funky and stuck MLF---it’s a headache! We have pure strains available. For large batches and barrels, use one of the options from Enoferm or Christian Hansen---we have both Alpha (WY51) and Beta (WY66) strains from Enoferm, each intended for inoculating up to 66 gallons. From Christian Hansen, we have a 16% high alcohol tolerant strain called Viniflora CH16. For a carboy you can use the 125 mL package of liquid culture from Wyeast 4007 (WY32). Our most popular choices are Viniflora CH16 and Enoferm Alpha due to the high alcohol tolerance (16% and 15.5%, respectively) and general dependability. Aside from your choice of culture, the main factors that will determine the success of your MLF are temperature, SO2 levels, alcohol level and pH. For all of our cultures, temperatures must be above 60° F (65°-70° is best) or the bacteria will go dormant. Post-fermentation SO2 additions must be avoided until MLF is complete. Alcohol tolerance of our cultures is in the 14.5-15.5% range (check your culture). You can see from those numbers that some wines, especially those big Zinfandels, can be difficult to get through MLF. There are rarely issues with pH. As long as you are above pH 3.2 it will be okay. We rarely see wines below that in Sonoma County. Assuming that your numbers look good and you can keep the wine temperature warm enough for active fermentation, you should be able to complete MLF in 3 to 6 weeks. How do you know when it is done? Ask your winemaker friends, but you may want to sit down to really enjoy the answers you get. Everyone has a trick. None of them work very well. Most are either guesswork or something like divination. Here’s a few popular answers. 1: You can see little CO2 bubbles in the wine when it is active. 2: You can hear it crackling by putting your ear to the barrel. 3: It smells like tennis shoes while fermenting. These all contain bits of truth, but also contain some winemaking myths. There is no way to know whether the CO2 production is from sugar fermentation or MLF and none of these techniques gives you a way to decipher between a complete and stuck MLF. Of course, there is this next reply. 4: Oh well, a stuck MLF will finish in the spring when it warms up again. While it is possible and sometimes this strategy works, it requires you to forego your normal SO2 additions that keep your wine protected through the fall, winter, and spring months. Once you believe it is done, test it to confirm completion. The only reliable method is to perform a test or have a sample tested at a lab. For home use we have a Vertical Chromatography test kit. It is a fun test to perform giving you a colorful chart showing the presence or absence of malic, lactic, and tartaric acid in your wine. Unfortunately it does not give you quantified results. If you bring a sample into our shop, you can run a malic acid test on our Reflectoquant meter ($5 meter use fee plus $6.95 per test you perform) and get your result in ppm of malic acid. Remember you want it to be below 30 ppm for assurance of stability. It’s a happy time for winemakers when the MLF is done and they can “put their wines to bed” for the winter. At The Beverage People, we have hundreds of conversations each year about these fermentations. We have heard all the problems and helped people complete MLF successfully year after year. We have seen winemakers struggle at it, especially when they get stuck. Our conversations with winemakers always follow a definite decision making course. So we decided to lay it out for your use---we created a MLF flow chart! Our first recommendation is to inoculate as discussed above, keep the temperature up and finish successfully in 3-6 weeks. 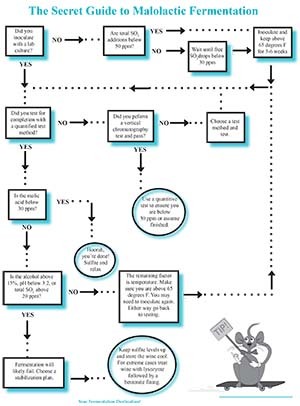 If things should go awry with your MLF, take a tour of the flowchart. It will help guide you to a successful finish. Open the pdf to work through our Secret Guide to Malolactic Flow Chart and find your way to a complete fermentation...or at least a stable wine.